Poppy seeds add a crunchy texture and slightly nutty taste to this sunny yellow quick bread. In a small bowl, stir and toss together all-purpose flour, almond flour, baking powder, grated lemon zest, salt and poppy seeds. Set aside. In the bowl of an electric mixer fitted with the flat beater, beat the butter on medium speed until smooth and light, 3 to 4 minutes. 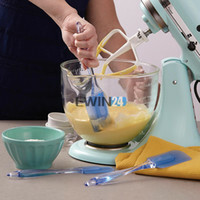 While the mixer is still running, slowly add the sugar and continue beating until light and fluffy, 3 to 4 minutes; stop the mixer occasionally and scrape down the sides of the bowl. Add the eggs one at a time, beating well after each addition. Reduce the speed to very low and add the flour mixture in three additions, alternating with the milk and beginning and ending with the flour, beating each addition until just incorporated; stop the mixer occasionally and scrape down the sides of the bowl. Spoon the batter into the prepared pan and bake until a toothpick inserted into the center of the loaf comes out clean, 50 to 60 minutes. Transfer the pan to a wire rack and let cool for 15 minutes, then turn the loaf out onto the rack and let cool completely. Does that poppy seeds look okay? I bet that will be a fine flavor. Looks delicious and so does the photography.